Can we still attract and grow disciples? Above, from left, David Cooper, Milwaukee, completing position as chair emeritus; Clarence William, CPPS, Director of the Institute for Recovery from Racisms; Jim Schexnayder, Oakland, completing board terms; Aidan McAleenan, Oakland; Bob Bonnot, Youngstown, chair; Peter Daly, Washington, D.C. , newly elected; Tulio Ramirez, a member of the Xaverian Missionaries of Yarumal, Bronx, N.Y.; Sister Jackie Doepker, OSF, executive secretary; Kevin Clinton, St. Paul-Minneapolis, vice-chair; Greg Barras, Biloxi, newly elected; Louis Arceneaux, C.M., New Orleans; Lee Baachi, Joliet, treasurer; Frank Eckart, Toledo, founding father and assembly organizer; Dan Divis, Cleveland, founding father, completing board terms; Jim Kiesel, Baltimore. Not pictured: Bill Spilly, Rochester; Michael J. Bausch, Rochester, newly elected. KEYNOTE ADDRESS: CLICK HERE to watch Father Richard Rohr at the 2018 Assembly. AUSCP Assembly: An exhibitor's reaction. CLICK HERE to view the response of Sheila Norris, courtesy Dan Morris-Young. AUSCP brings hope, according to Alphonse Mirabal. See the video below. NEW July 12, 2018: The Wander publishes the second of two stories on the AUSCP Assembly. CLICK HERE to read the story by Dexter Duggan. 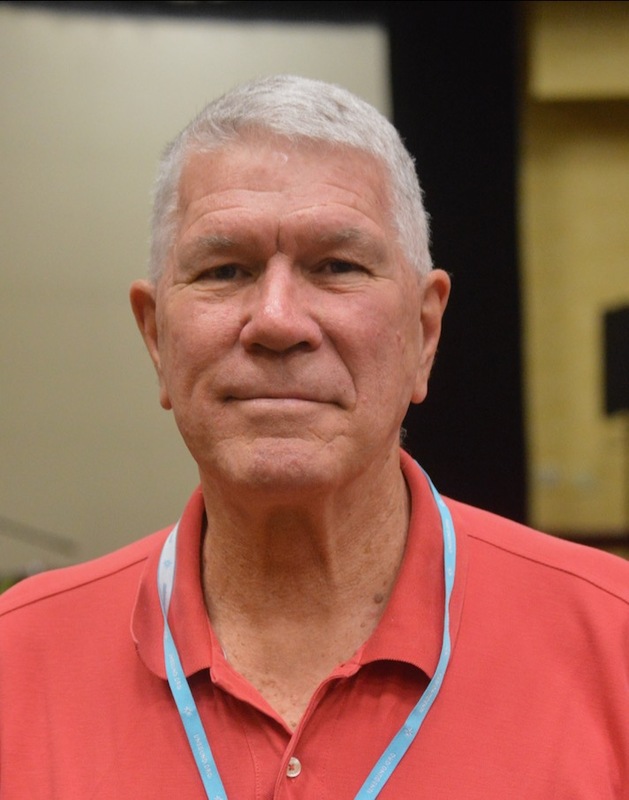 Regarding Pastoral Ministry and LGBT People: "It is timely that AUSCP raise its voice in defense of informed and compassionate ministry with LGBT people." In part, the approved resolution stated: "We endorse the We Are Church Ireland petition that the Church change its language about LGBT persons." To read the petition and to add your signature, CLICK HERE. 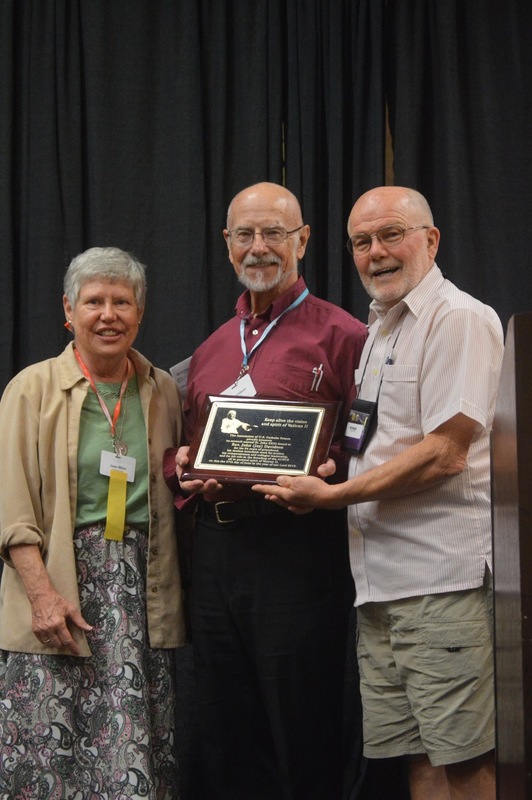 FACES AT THE ASSEMBLY: Below, Bishop Robert McElroy; AUSCP Friends, Paco Wertin and Sister Joan Miller; Colloquium Leader Deb Rose-Milavec; Sister Katarina Schuth OSF. • Dan Morris-Young of NCR provides an overview of the assembly. CLICK HERE to see the story. • The Wanderer publishes the first of two stories by Dexter Duggan. CLICK HERE. 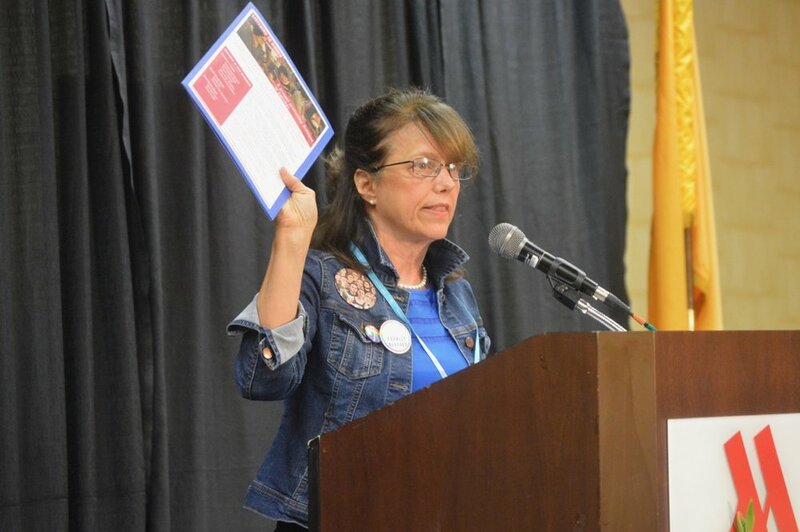 • KOAT TV News in Albuquerque reported on AUSCP concerns for families at the border. CLICK FOR JUNE 25 STORY HERE. OR CLICK HERE to see JUNE 27 story. in the year of our Lord 2018. Father Kevin Clinton, from the Archdiocese of St. Paul-Minneapolis, stands with Father Richard Rohr OFM after presenting him with the St. John XXIII Award, June 27, 2018. Sister Joan Miller OSF, who nominated Father Jay Davidson for the award, stands with the honoree and Father Bob Bonnot of Youngstown, following the presentation of the award, June 27, 2018. Below: Greg Barras, Biloxi; Michael J. Bausch, Rochester; Peter Daly, Washington, D.C.
Navajo Eagle Dancers lead the entrance procession from the Marriott Pyramid North to the Pavilion June 27 for Mass with Archbishop John C. Wester. 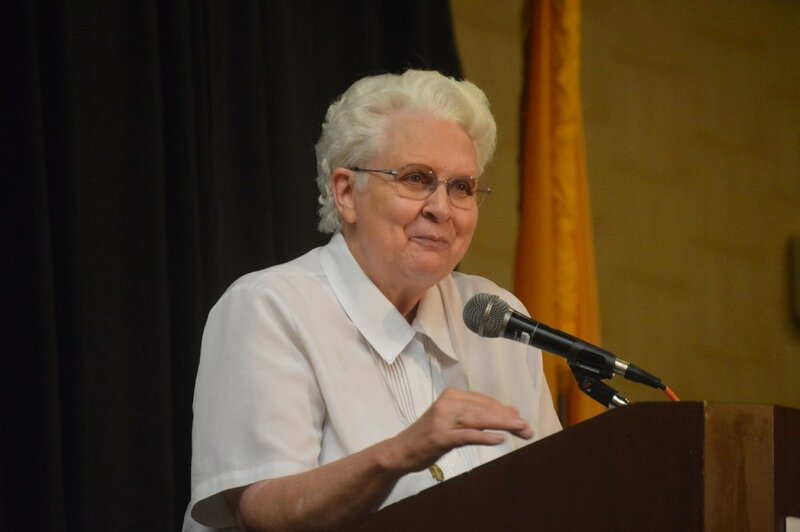 Katarina Schuth, a member of the Sisters of Saint Francis of Rochester, Minnesota, and the author of the influential book, Seminary Formation. She is a leading figure in the fields of Pastoral Theology and the Sociology of Religion. • READ Krista Tippet's On Being interview with Richard Rohr.